Let it be known in the gates! I like Nancy Moser's Women of History series. I first stumbled upon Just Jane at our local bookstore. I didn't buy it because I was unfamiliar with it. However, shortly thereafter, Jennifer asked me if I wanted to review Washington's Lady for 5 Minutes for Moms. I figured a review copy was a good way to familiarize myself with Moser. Turns out I LOVED Moser's style. Being a fan of learning about history (and currently pursuing a degree in it! ), I have a bent towards historical fiction to begin with. I particularly like the way that Moser uses the spelling rules from the times at which she writes and has her characters speak as best as we imagine that they did "back in the day" (as opposed to writing dialogue of the 21st century or what have you). She researches her stories and her characters and incorporates facts into her writing. When she isn't sure exactly how a particular incident came to pass in an individual's life, she researches as best as she can and fabricates a scenario that she thinks suits what the person might have or could have done. In the back of her books, she clearly states to the reader what parts of her book were fact and what was fiction, to dispel any ambiguity. Although her historical fiction books are not the things of fact I typically love, I think her "Women of History" series does a great service to readers of the day because the characters she writes about are so engaging that I'm frequently drawn to learn more about them. The lives and the times she has chosen to engage us with truly are fascinating and I find myself getting lost in her books for pure enjoyment purposes. That said, I'm really not one for keeping up with new releases (of anything) and I didn't realize that Moser had released another book until I saw that Lisa had reviewed How Do I Love Thee? over at 5 Minutes for Books! (Due to Lisa's review being the primary motivation that I sought out this title, I'm linking this review up to the I Read It Carnival at 5 Minutes for Books.) Then I found that Barbara was reading it too! How Do I Love Thee? is the story of Elizabeth Barret Browning and her "poetic romance" with Robert Browning. I feel like Barbara gave a good overview of what the book is about on her site and there is much I can add to it. My opinion of the book matched Barbara's well. Of course, Elizabeth and Robert fall in love and she ends up defying her father, who has forbidden any of his children to marry (for unknown reasons) by marrying. The book is written in such a way as to cause the writer to want to cheer when she finally breaks free of her bedroom, her house and her father. However, I have to say that the book didn't produce that response in me (even though I know that was what I was supposed to do). For my part, I just found her story so overwhelmingly sad that I didn't find anyone to really be the winner in the situation. At the risk of spoiling the book, I will simply say that although Elizabeth and Robert found love in the end, there was a price to pay for it. I don't read history or learn about it to give me warm fuzzies so it doesn't bother me to come to the end of a book about a historical figure and feel dissatisfied with them. That should not detract from the author's writing skills which drew me in to the book in the first place. Rather, I read about people in the past to learn about my present and my children's future. History should be a lesson to us, practically and spiritually and therefore I highly encourage the exploration of it in any form, fictional or otherwise. If a book can open your eyes to the past and make you think about the way that you live, then I think the book is worthy of some consideration. Moser's Women of History series is definitely worth some consideration. They are healthy, fun, informative, reflective, well written and (moderately) defended books of which I do enjoy. How Do I Love Thee? is no exception to this rule. I'm very glad to have read it. I enjoyed reading your review. The book inspired me to want to check out both Robert's and Elizabeth's poetry, though I haven't yet. I thought it interesting, too, the poems she is most known for were the ones written after she met Robert, and that some of them he hadn't even read until later in their marriage. I really enjoyed his more buoyant personality, too, and the way love for him drew her out of herself. I thought the scene with the flower petals after she went to the park for the first time one of the most beautiful I've ever read. I've read Just Jane (loved it! ), and have HDILT in my TBR stack. I haven't read the others, but would like to. 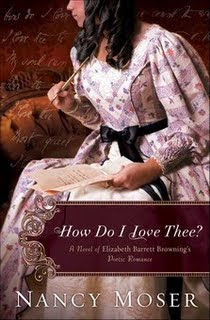 I just finished reading "How Do I Love Thee?" and loved it (my first Moser book)! "Just Jane" is in my stack of books to read.